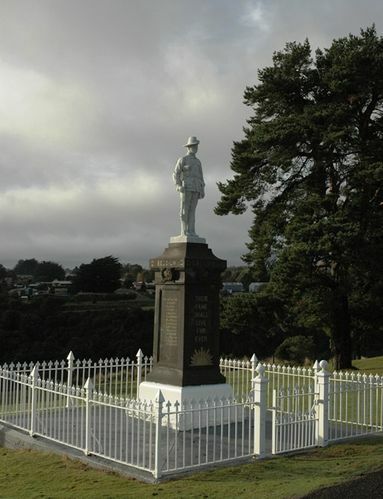 The memorial is a marble statue of a World War One soldier standing at attention which commemorates the 39 local men who served in World War One. A social was held in the Athenaeum Hall, under the auspices of the fallen Soldiers' Memorial Committee, to terminate the functions of the committee, and also to allow the public of Waratah to express in a practical manner their appreciation of the efforts of the ladies' committee and the hon. sec., Mr. Baly. In May, 1919, a public meeting was held in St. James Hall, Senator J. D Millen presiding. An executive committee was formed to carry out the erection of a suitable monument and to raise the necessary funds. Early in 1920, a contract was entered into with S. P. Wilmot, of Launceston, for the construction and erection of the memorial, and on March 1 of that year the foundation stone was laid by General Birdwood. The complete memorial was unveiled by Colonel Rafferty on 16th July, 1920, and when one takes into consideration that several towns much larger, and more prosperous than Waratah have only just commenced their memorials the community should be proud of its achievement, which was mainly due to the zealous efforts of our capable secretary, Mr. Baly. The total cost of the memorial was £334/2/-. Advocate (Burnie) 3rd January 1924.